All students are supported in a range of ways when they start at Rosebud Secondary College. We have House System which is new in 2019. We aim to build healthy, resilient students who will thrive in school and adult life. 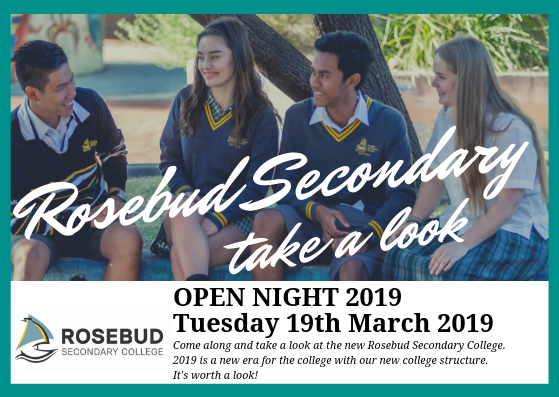 Rosebud Secondary College works in partnership with regional primary schools to ensure students make a seamless transition into life at secondary school. This begins while the students are in Year 6, with Transition Interviews and Orientation Day in Term Four providing opportunities for them to meet their teachers and classmates, and learn their way around the College grounds. Period 1: Students meet in the College Hall and are allocated into their form groups (as at Orientation Day.) Students are then welcomed into Hillview Stadium by the rest of school for their first full-school assembly. Periods 2 – 6: Students meet with their teacher to receive their timetables, and have time to arrange the rest of their day. Students attend their timetabled lessons. THE TRANSITION PROCESS for GRADE 6 into YEAR 7 for the CLASS OF 2020 begins from the start of the year with open nights and open mornings. Active Minds for all Grade 5 students who obtain a place within this program. More information throughout the year. End of Term Two: SEAL Interviews conducted and successful applicants notified in August. End of Term Three: Enrolment Packs distributed to the Primary Schools which includes Enrolment forms.